Last Saturday night (May 19th) in the California Sierra foothills near Fiddletown, I spent some time mesmerized by the scores of galaxies in the rich Coma cluster (Abell 1656). If you dream of viewing wall-to-wall galaxies comparable to the Hubble Deep Field, Abell 1656 is probably as close as you're going to get. After recording several new galaxies around the eastern periphery, I realized while entering my observing notes the next day that I had accumulated a collection of over 100 members in Abell 1656. So it seemed like to good time to summarize some of these observations. A good chunk of this exploration was made in the mid-80's with my 13-inch and in follow-up trips with my 17.5-inch in 1990 and 1994 from Fiddletown in mag 6.5+ skies. 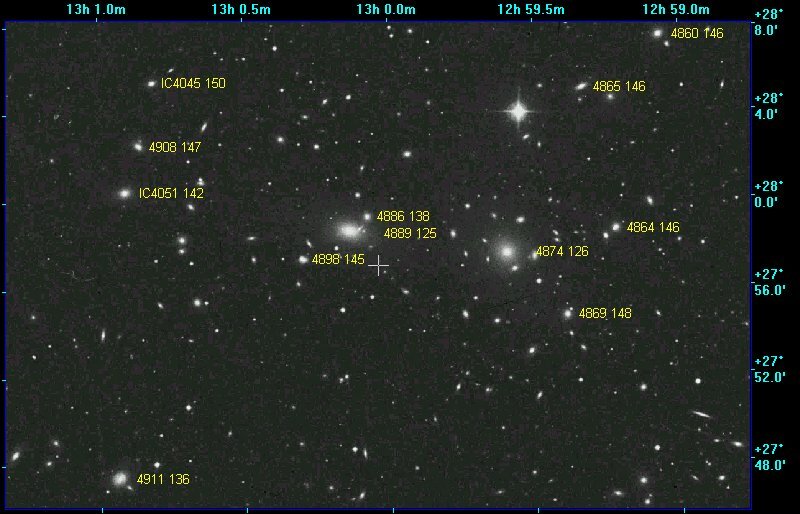 At that time I used a photograph of the cluster as a finder chart and the Webb Society volume on Clusters of Galaxies to identify the members. With more comprehensive computerized star charts available today this project would be a lot easier and could reach to fainter members. As far as verifying the members of Abell 1656, I used NED to verify redshifts (roughly 7000 km/sec) and cluster membership. Most of the members I observed are within one degree of the center and all fit within a three degree circle. Abell gave the cluster size as approximately five degrees but there is no clear boundary and a bridge of galaxies heads west towards Leo ending in another rich cluster, Abell 1367 (Leo I), forming the Coma-Leo Supercluster. This distant sea of galaxies (~350 million light years distant) is roughly circular and increases in density as you move towards the core which is dominated by two bloated galactic whales -- NGC 4874 and NGC 4889. These giant ellipticals both appear to be surrounded by a school of tiny fish, a number of which they have probably feasted upon in the past (galactic cannibalizing is quite common in the cores of rich clusters). A 6-inch scope will pull in the brightest cluster members but to really make out the multitude of weakly glowing minnows, a 12-inch or larger scope is necessary. Furthermore, a somewhat annoying mag 7.2 star is situated just north of the core of the cluster, so using moderately high power to navigate these waters will help. Nearly all the galaxies in the central nest are ellipticals, with the few cluster spirals hanging out around the periphery, so in general you won't see a lot of interesting detail among the members. The larger and brighter of our sea leviathans is N4889, a moderately bright oval extended E-W containing a bright core. Several tiny, weakly glowing companions huddle nearby including N4886 1.0' NW, N4894 1.9' ESE, N4898 2.4' SE -- all three of these nebulous blurs are strung out nearly on a line from N4889 while IC 4011 is just 1.6' N. Swimming out a bit further north brought me to N4883 4.4' NW and the close pair IC 4021 4.1' NNE and IC 4026 5.2' NE. Keep in mind that all these galaxies (any many, many more!) were visible in the same 20' field. N4874 is the second brightest member in the core of Abell 1656 and is situated 9' west of N4889 and just 6' south of the mag 7.2 star. Although this supergiant elliptical is easy to capture in a 10-inch or larger scope, the only noticeable detail is the bright core and a mag 12 star about 2.5' WSW. Surrounding its halo the background sea has a mottled, roiling appearance due to a whole fleet of dim companions nestled around the edges. Within 5' no less than 11 companions were visible at 280x in my 17.5" -- N4872 52" SSW, N4871 1.3' W, N4873 1.6' NNW, PGC 44652 1.9' E, IC 3998 2.6' ENE, N4875 3.1' S, N4876 3.4' SE, N4869 4.0' SW (look for a mag 14 star attached at the NW edge) and IC 3973 4.6' S. Finally, 5' W is the close double system N4864 and N4867 (40" between centers). Most of these appear as 15"-30" featureless blurs, but cranking up the magnification increases the contrast and is absolutely necessary to pin down the identifications. If you can navigate through the dense central region, it becomes easier to wade through the surrounding fields. Head off southwest of N4860 along a trail of galaxies and you'll pass dim IC 3960 at mag 15.9(B). Another 3' SW is one of the few spirals to be found floating here -- IC 3949. Continuing the trail another 2' brought me to IC 3946, a 14th magnitude oval extended 2:1 WSW-ENE. From here the trail of weakly luminescent glows heads southeast to IC 3947 (1.5' SE of IC 3946) and continues on to IC 3957, IC 3959, ending at IC 3963 (the last three form a small equilateral triangle). These IC galaxies were all discovered by H. Kolbold using the 18-inch refractor at the University of Strausberg. On the evening of the 19th of May, I decided to swim east from N4889 towards the eastern edge of the cluster. IC 4042, situated 7.6' E of N4889 is in the center of another dense school of pulsating lights. N4906 was a 20" knot 4.4' due south while IC 4041 was a fainter blur less than 2' north. A bit brighter and larger are IC 4051 about 2.5' NE and N4908, which has a mag 15 star attached at the NW edge. About 16' east of IC 4042 is the solitary glow of N4927 which has a sharp, bright core. A mag 15 star is just off the north edge, 25" from center.With N4927 centered, N4929 was picked up at the east edge of my 21' field (at 220x) as a faint 25"x20" glow of even surface brightness, just 1' following a mag 13.5 star. This was the first of three on a line with N4931 3.7' ESE and N4934 7' ESE. N4931 had a distinctive nearly edge-on appearance, 0.5'x0.15' with a small bright core which occasionally appeared stellar. The last of this trio, N4934 was a tiny sliver, perhaps 0.4'x0.1', extended WNW-ESE with a low surface brightness. An additional five galaxies were spotted within 15' of N4929 running the total up to 104 members. And next time out, I plan to return for more!